Print and complete the Volunteer Application Packet. Follow the instructions for the background check process at the back of the Volunteer Application Packet. This includes a $44 processing fee. The HR Department will contact the potential volunteer after the background process has been completed and CMS has received the clear background from the background company. When you are contacted, you will be given instructions to complete the SafeSchools videos that are required for all CMS employees/volunteers. In the meantime, read the Volunteer Handbook. You will be asked to sign an acknowledgement of receipt of this Handbook as part of your application processing. 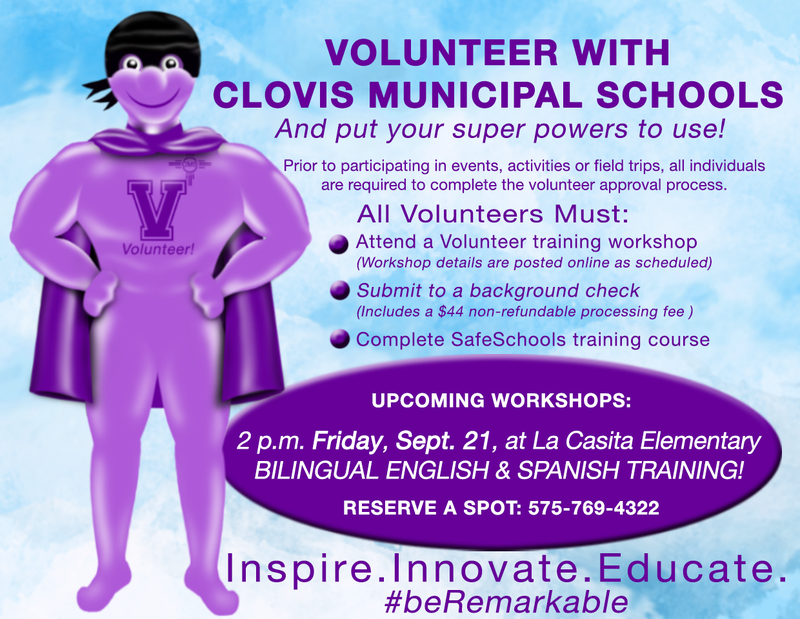 Call CMS at 575-769-4300 to get onto the “Volunteer Training” list for the upcoming training session. Attendance to this training is required in order to volunteer for CMS. **Volunteer trainings are held on a bi-monthly basis. Training dates will be posted on the CMS Website. First you must attend one of our orientation sessions. View the calendar below for current workshop dates and call 575-769-4300 to attend.